Figure 1: A basic 6-button footswitch USB MIDI controller. LEDs show button state. There are a few simple options out there. In the first instance, an Arduino would probably cut it. I could use the serial port, or run a MIDI library to get what I need. Arduino is simple to learn, but I didn’t really need all the extras (or the board size). A Teensy is a smaller, equally affordable, and in some cases, a more versatile microcontroller that gets used a lot in USB MIDI and Music Tech related projects. And there’s a handy MIDI library already out there. So I opted for a Teensy (v3.2). I sourced a cheap aluminium box here (a nice diecast Hammond box would have been lovely and heavier duty, but they’re expensive. This (Takachi Electric Industrial, MB-14) was 5 quid). For my current purposes, I only need 4 switches, but I got carried away and cut holes for 6 — not realising that this narrows the footprint considerably, making this a tricky thing to trigger with shoes on. It’s also a real mess of wiring inside as a result. If I’d thought about it before, I would have limited the switches to 4. As they say: measure twice, cut once. Lesson learned. Figure 3: I took the strain off of the Teensy’s USB port by adding a panel-mount USB cable. It also allows me to use a slightly heavier-duty USB-B-type connector, as opposed to the Teensy’s micro port. The code for the Teensy is simple given Josh Nishikawa’s MIDI controller library available here (Note, that I’m interested in MIDI controller numbers/values, not MIDI notes, Teensy can handle regular notes without a library). I’m only using the Pushbutton, assigned as MIDI control numbers (20-25) as they’re typically unassigned. This could also be serial, or MIDI note numbers rather than controller number. The code is simple: when a footswitch is pushed, fire off a MIDI control value of 127, otherwise it’s zero. When the pedal goes down, the LED pin is also lit up. In Max, all I need to read this is a [ctlin], [pak] and a [route 20 21 22 23 24 25] and I’ve got my pedal triggers into Max (see .maxpat in my git below). Easy. We’re gonna need a bigger boat. The initial plan was to include jack sockets and a stereo TRS jack so that I could plug in keyboard sustain pedals and an expression pedal to read as MIDI controllers. The code is simple, but since I didn’t leave myself enough space in the box, they won’t fit now. Push-and-hold. My Max patch takes care of held buttons for flexibility, but this could easily be programmed in at the MIDI device level. Currently, if a button is held for x seconds or more, it clears a buffer. Writing in at the Teensy level would let me have LED feedback too (light flashes after x seconds). I suppose I could set this anyway, but without it linking directly to the Max value (via serial?) there’s little point. a short test video, playing around with open-circuit percussion practice (as heard in Bonnie Jones, Machinefabriek, etc. ), but used to drive passive loudspeakers and transducers on percussion instruments. After an absence of over two years I’m brushing the dust off. I’m powering machines back up, replacing snapped strings, retuning and broadcasting once more from West Yorkshire. Seth Parker Woods (USA), a supremely brilliant cellist and a very dear friend, commissioned khepri for Cluster festival in Winnipeg, CA. khepri for solo cello focuses on the tiny noises of the cello as Seth performs some fiercely quiet bow taps and finger strikes. Premiered 2nd March 2018, Winnipeg, CA. There is no recording of the premiere, so instead check out Seth performing Iced Bodies here with Spencer Topel. An intense re-imagining of Jim McWilliams’ Ice Music (1972). abate ablaze abrade was commission by London’s Plus-Minus ensemble and premiered 27th March 2018 at City University, London. Other new works by Ben Jameson; Alice Jeffreys; Lawrence Dunn; Caitlin Rowley ; and Monika Dalach. It’s a slow, tangling trio for bass clarinet, piano and cello. Due to noisy lights (a sure sign that your music is quiet), the performance took place in the dark which was wonderfully evocative and testament to how brilliant these musicians are. Bass clarinet—Vicky Wright; piano—Mark Knoop; cello—Alice Purton. polynya, or ever less is an etude for electric guitar, written for Yaron Deutsch’s concert and guitar studio. The piece uses a glass test tube to bow the strings, while the free hand plays soft hammer-ons. It’s quiet in spite of the amplifier. Glacial shredding. 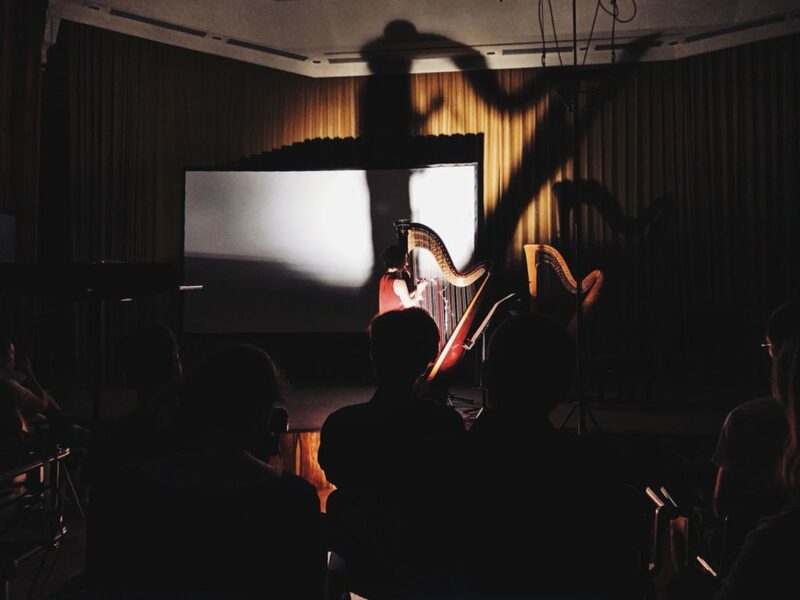 o horizon, gloa on the forest floor was written for harp and a hand full of metal, and will be workshopped by Gunnhildur Einarsdóttir’s Harp studio. The piece builds up a number of tectonic hums and scrapes, as the player slides along the string with a hand of metal. Sensual scratching. Further ahead, Ensemble Nikel (who, I suspect, a couple of you will have seen at last year’s hcmf//) will be ensemble in residence at Gaudeamus festival in Utrecht, NLD. If you’re there, they’ll be playing my whose veil remains inscrutable on 6th September 2018. In 2017 Ensemble Nikel released their retrospective 4CD+DVD+BOOK box-set A DECADE. It features their recording of my whose veil remains inscrutable that we made in Bern in 2015. It’s an exceptional performance and a wonderful album that I’m delighted to feature on. Audio excerpt here. 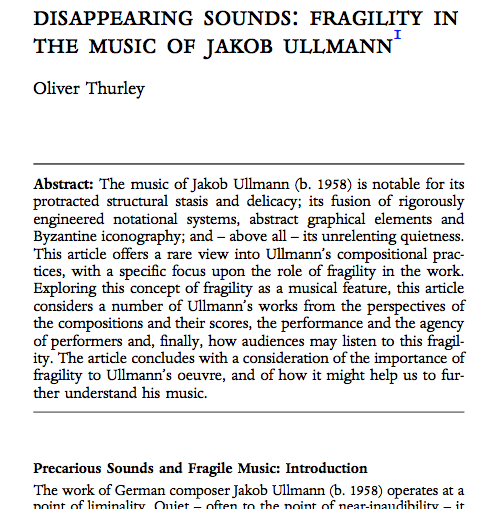 If you read my 2015 article Disappearing Sounds: Fragility in the Music of Jakob Ullmann in TEMPO (Vol 69, Issue 274, Cambridge University Press), I’ve written a sequel. Rebuilding Babel: On Fragility And The Palimpsest In Jakob Ullmann’s voice, books and FIRE (Vol 71, Issue 282, Cambridge University Press) was published in October 2017. It focuses on Ullmann’s huge cycle voice, books and FIRE and is similarly unwieldly. I also reviewed Apartment House’s premiere of a new Christian Wolff piece, performed alongside Cage’s Concert for Piano and Orchestra(1957–58) for TEMPO’s January 2018 issue. It was good. That’s it for now. I’m going to try to make an effort to post more as I make more work, so, err… consider yourself warned? Posted on June 27, 2018 Categories CompositionsTags burnout, composition, news, performances, rebootLeave a comment on Is This Thing Still On? last week, I released a new album of solo material. larynx, closing is a collection of two, or maybe three, or maybe four pieces across one hour and twenty minutes. it is very quiet. viola. harmonium. Klaus Lang on Ilkley moor. This film couldn’t have been made without Ollie Jenkins, who took care of all the filming and editing, and Elspeth Mitchell, who helped organise and produce everything. The project was part-funded by the Centre for Practice-Led Research in the Arts (CePRA) at the University of Leeds. Thanks also to Helen Barker and Rex Russell for their assistance. Posted on January 24, 2016 Categories CompositionsTags acoustic, composition, drone, film, harmonium, ilkley moor, klaus lang, quiet., soundscapeLeave a comment on viola. harmonium. Klaus Lang on Ilkley moor. A slight digression from the usual “contemporary classical(ish)” stuff, I’ve released a new tape under my WITH ZERO moniker. 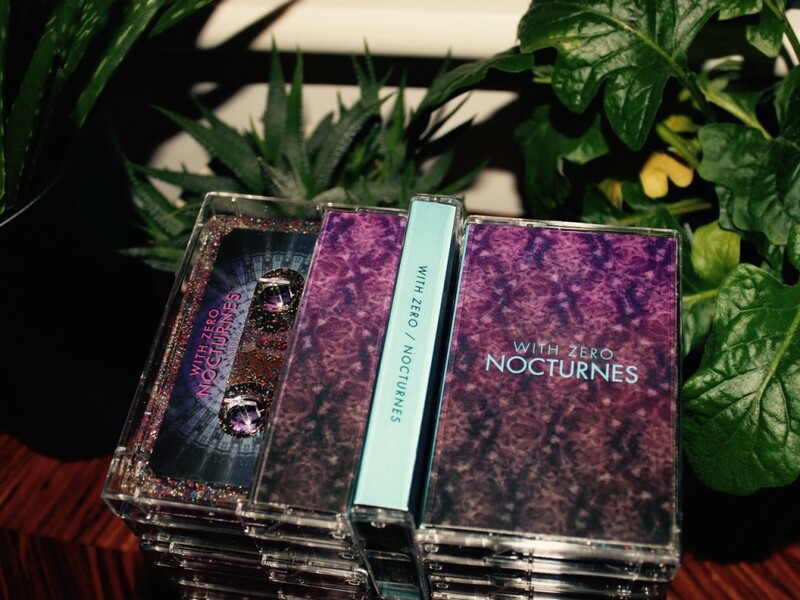 NOCTURNES is a 60-minute slow-burning new age piece, intended for deep nighttime listening, meditation and states of half waking/consciousness. 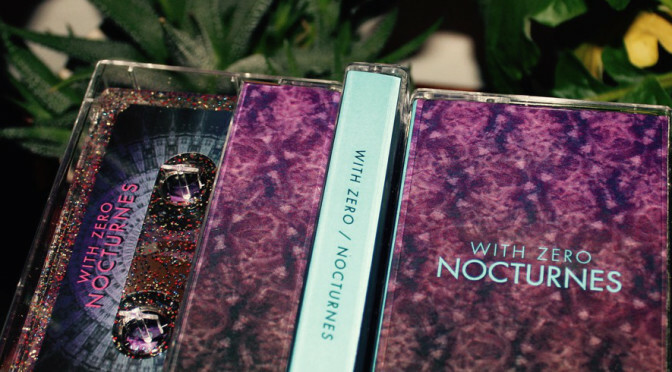 The cassette comes in a limited edition of 50, pro-dubbed on transparent glittering shells (because, y’know…) and is available via bandcamp. 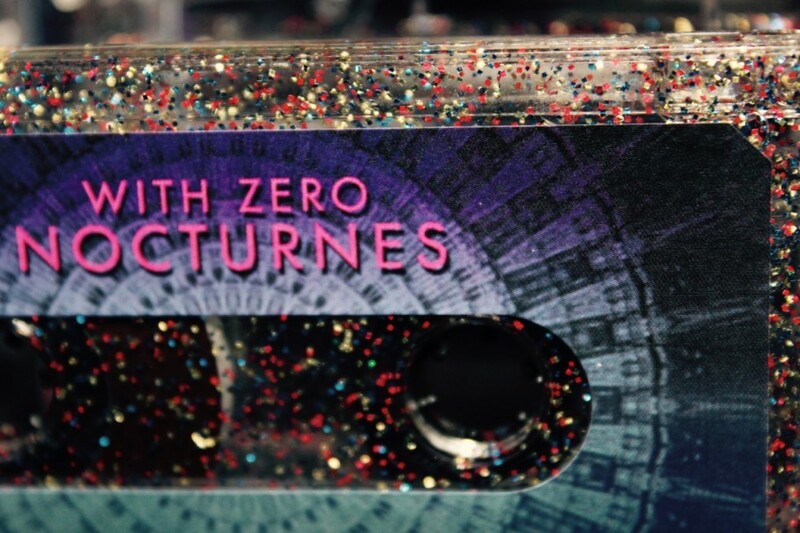 The WITH ZERO project has been around since about 2012, mainly as a hard drive with which to store miscellaneous synthesiser sketches. 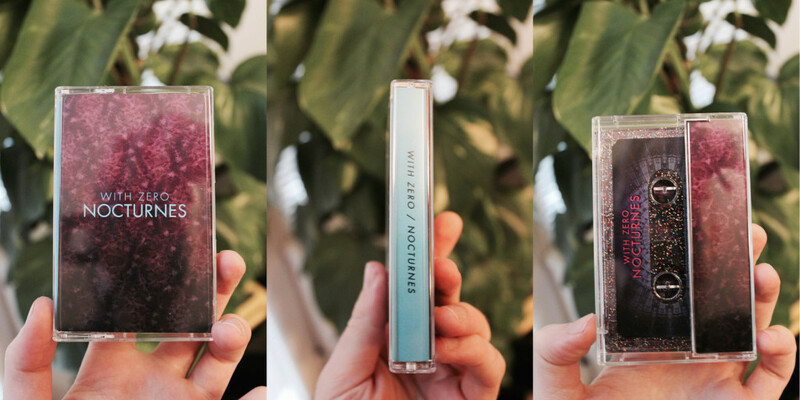 This is the first proper release, with a few more in the pipeline for the next couple of months. I recently wrote an article on fragility in the music of Jakob Ullmann. I’m very pleased to say that it is now available, published in the excellent TEMPO music journal (Volume 69 / Issue 274, Cambridge University Press). If you have institution access (or a subscription, which is well worth it), you can read the article here, otherwise, I hope to make the text available as soon as I figure out a way around academia’s archaic copyright systems ( cough email me cough). Fl., eh., tbn., perc., hf., va., vc., cb. Ob., eh., tbn., perc., va., vc., cb. Voice, 2 fl., b.cl., vl., tbn., va., vc. i: fl., eh., tbn., hf., 4 vl., 6 va., 2 vc., ii: ob., bssn., tr., 4 hrn. , timp., 2 vl., va., 2 vc., 2 kb., iii: kl., basskl., bssn., tr., 7 vl., 2 va., vc., iv: picc., fl., eh., basskl., 2 tbn., 13 vl., va., 3 vc., 4 cb., 3 perc. i: fl., b.cl., tbn., eh., 2 vl., va., 2 vc., 3 cb., string trio i; ii: 4 hr., pno., vl., 2 va., 2 vc., 3 cb., string trio ii; iii: fl., tbn., cl., bssn., timp., 2 vl., va., vc., kb. i: fl., b.cl., tbn., perc., 5 vl., 2 va., 3 vc., cb. ; ii: bssn., 4 hr., tr., 6 vl., va., 2 vc., 2 kb; iii: fl., ob., 2 cl., bssn., timp., 6 vl., 2 va., 2 vc., kb. ; iv: eh., tbn., 6 vl., 3 va., vc., cb. ; v: fl., eh., tbn., perc., 5 vl., 2 va., vc., 3 cb. ; 5 s. Fl., e.hn., cl., tbn., vl., vc., cb., perc., pno. Fl., e.hn., cl., vl., vla., vc., cb., perc. Voices, fl. e.hn., cl., 2 vl., 2 vla., vc. Voices, fl., hn., vl., vla., vcn., cb., perc., speaker and electronics. Currently, the voice, books and FIRE series remains unfinished. 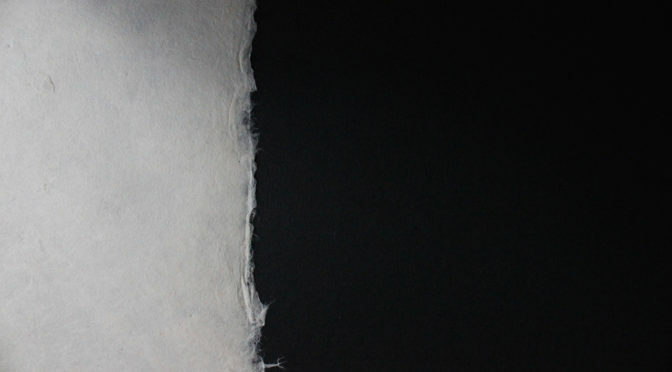 The final piece, voice, books and FIRE II/3, is due to be completed by 2019. The original score to voice, books and FIRE I however, remains lost. The solo sections of the original score to A Catalogue of Sounds have been lost and the sketches are no longer extant. Parts 1-10 remain lost, whilst 11-13 have been recreated using fragments of the string ensemble parts. The published score features 4 violins, 5 violas, 3 violoncellos and 1 contrabass. For the Solo series (currently I-V), any constituent parts may be played simultaneously. For example: Solo I+II+III or Solo II+IV+V.